Our office uses the latest in x-ray technology. Our pananoramic x-rays offer a detailed image of your entire mouth. We take x-rays of the teeth, sinuses and jaw. This allows us to see the whole mouth in one photo and allows us to see how each relates to each other. X-rays play an invaluable role in the diagnosis of dental problems. An x-ray provides a clear picture for a dentist to accurately diagnose and provide the necessary treatment. During the consultation, you and Dr. Dental will discuss your case in detail to determine if you're a good candidate for Invisalign. Invisalign now addresses many cases, from simple to more complex. Dr. Dental will determine if Invisalign is right for you. This will also be your opportunity to ask any questions about Invisalign, costs , dental/orthodontic insurance, or any other concerns. If you find Invisalign is right for you Dr. Dental will take x-rays, pictures and impressions of your teeth, which Invisalign will use to create a digital 3-D image of them. From these images Dr. Dental will map out a precise treatment plan, including the exact movements of your teeth. Using this same technology, Dr. 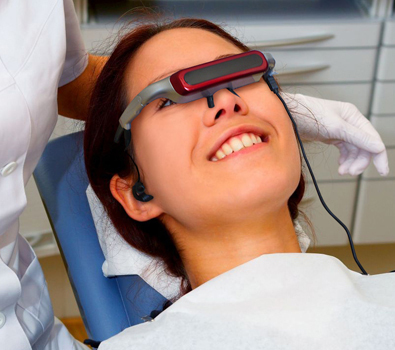 Dental will even be able to show you a virtual representation of how your teeth will move with each stage of treatment. Approximately every two weeks, you will begin wearing a new set of aligners, advancing you to the next stage of your treatment. To monitor your progress, you will also have occasional checkups with your doctor, usually only every six weeks or so. At every stage, you will be able to see how much closer you are to having the smile that reflects the real you. While every case is unique to each patient, treatment typically takes approximately a year for adults. For teens, the length of treatment is comparable to that of braces, but since your teeth won't be covered by wires and brackets, you'll be able to see improvement much sooner. For best results and a timely outcome, you should wear your aligners for 20 to 22 hours per day, throughout your entire treatment. Invisalign is continually making technological advancements in the product and treatment process for even better clinical results. Most recently, the addition of Precision Cuts allows Invisalign clear aligners to now accommodate the use of elastics. As a result, more severe bite issues can be corrected effectively. Here are some of the main conditions Invisalign currently treats. But if there is a specific dental problem that you do not see addressed here, please contact Dr. Dental for more information to see if Invisalign is right for you. What people commonly refer to as an "overbite" is known to dental professionals as "overjet." It occurs when the upper teeth bite over the lower teeth. It's typically caused by genetics, bad oral habits, or overdevelopment of the bone that supports the teeth. This can lead to gum problems or irritation, and/or wear on the lower teeth, and can cause painful jaw and joint problems. Underbite can occur when the lower teeth protrude past the front teeth. It's usually caused by undergrowth of the upper jaw, overgrowth of the lower jaw, or both. It can also be caused by missing upper teeth. This can prevent the normal function of front teeth or molars, which can lead to tooth wear. It can also cause painful jaw and joint problems. Patient receiving restorative or cosmetic dentistry treatments can relax and watch their favorite movies at the same time. We provide "virtual reality" goggles that feature fully adjustable stereo sound and can be worn over eyeglasses. Patients can bring in their own movies or choose one from our library.